Ernst Reijseger is a master of the cello, conjuring Bach’s variations, hard bop bass lines in the style of Mingus, and even African style hand drumming. The rest of the ensemble is equally unprejudiced and inimitable: pianist Harmen Fraanje creates imaginative melodies at the crossroads of classical music and jazz, and the Senegalese musician Mola Sylla interprets his own cultural traditions with strong vocals and a charming selection of African instruments. The resulting musical mix is powerfully original, and not only cresses genre categories, but completely transcends them. The Trio’s music transforms from fierce dramatics to good-humored playfulness. In addition to taking unprecedented music risks, the trio first and foremost takes joy in performing live. The combination of these musicians and this instruments create a very authentic sound and a unique character; a humorous, generous world where an outpouring of improvisational brilliance is guided by a fearsomely dedicated technique. The repertoire contains African songs in Wolof, the native language of the Senegalese singer Mola, and beautiful musics by Ernst and Harmen, some of which are composed for the films of Werner Herzog. Imagine this in combination with the lyrical melodies of the very sensitive Dutch pianist Harmen and the always surprising ‘improguru’ Ernst. A must-see! 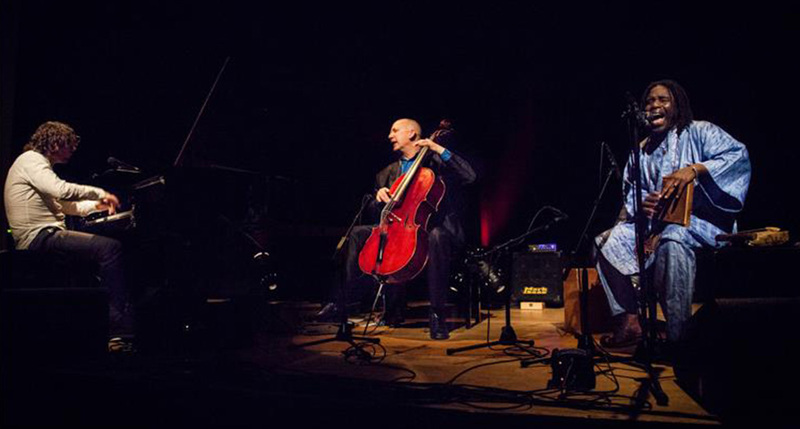 This trio creates personal music, evoking strong reactions of audiences. Like spirituals maybe, played by an atheist, a vegetarian and a mussel man. The musicians all contribute with original compositions. Their different backgrounds and individual vocabulary connect miraculously natural. 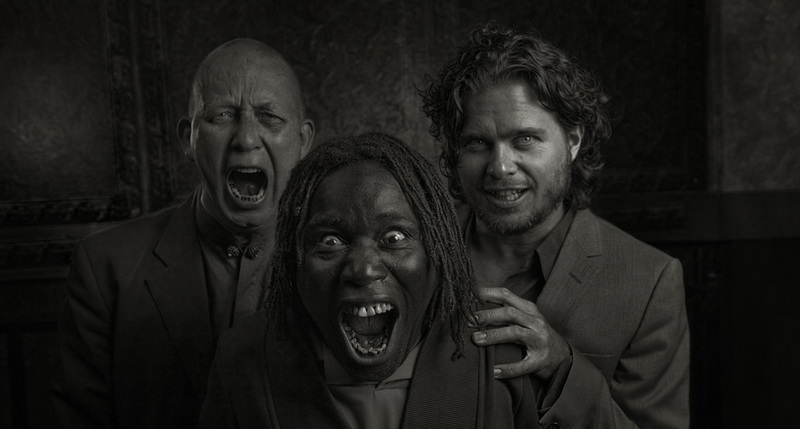 Reijseger, Fraanje and Sylla got to know each other well over the past years and shared many adventures, both as a performing trio as in other projects, such as film scores for Werner Herzog’s ‘My Son My Son What Have Ye Done’ and ‘Cave of Forgotten Dreams’. Playing together became addictive. When producer Stefan Winter asked Reijseger what project he wanted to record next, Reijseger said: “This trio is it, because I have found, completely by coincidence,this great pianist and this angel of a singer, that make me play differently and vice versa times three. It is a living organism, this trio. Not a concept. In fact its concepts change all the time.New approaches occur and are recognized by its members. No democracy, but sensitive cooperation. The concerts and soon to be released live-to-two-track recording reflect this approach. The trio plays ‘readings’ of their material. This means that the form occurs while performing. No structure is set beforehand. The trio rehearses just options and practices in communicating musically. This clears the way for surprising music with heartfelt expression. Since the early beginning of Winter & Winter, the Dutch performing-artist, cellist and composer Ernst Reijseger has recorded numerous albums and soundtracks with the label.Ernst Reijseger and the team of Winter & Winter have developed a longstanding, close and fruitful collaboration. Every album has its own history and identity. Ernst Reijseger, the magician of special sounds, has presented cello solo works and collaborations, for example with the Voches de Sardinna, Groove Lélé from Réunion,the Nederlands Kamerkoor, and also the wonderful voice of Senegal, Mola Sylla.In May 2012, Ernst Reijseger, the singer Mola Sylla and the jazz pianist Harmen Fraanje came together to record »Down Deep«. Mola Sylla, who’s from Dakar, met Ernst Reijsegerjust after he played his first concerts in Amsterdam in the late 80s. Since then Amsterdam has been Sylla’s home base.Ten years after this first meeting, Mola Sylla asked Ernst Reijseger to perform concerts as a duo. This was the beginning of a strong musical partnership. In 2002, Reijseger recorded the album »Janna« with Mola Sylla for Winter & Winter. The joint path with the Dutch pianist Harmen Fraanje started in 2008. In 2009 and 2010 Ernst Reijseger recorded film music for Werner Herzog (»Cave Of Forgotten Dreams«) with Mola Sylla and Harmen Fraanje.Ernst Reijseger, Mola Sylla and Harmen Fraanje form a body of sound. On »Down Deep«, in addition to Giacomo Puccini’s »E lucevan le stelle«, they have dedicated their own compositions to the project so that their individual vocabulary connects in a natural way. To capture the real moment, I have asked Reijseger, Fraanje, Sylla to record this album live-to-analog-two-track without any digital editing and without any digital manipulation. Only hand-selected microphones were used to transmit the sound without processing to the analog tape. »Down Deep« brings together musical elements and playing traditions of the most divergent cultural horizons. 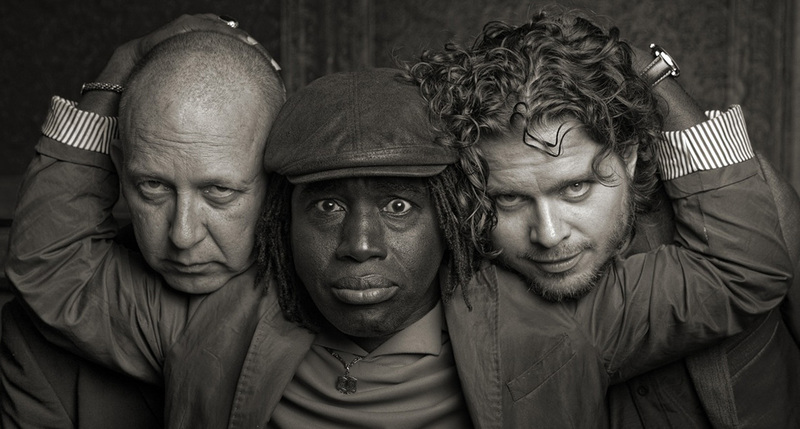 Reijseger, Fraanje and Sylla create an inimitable and impressive sound which reflects the unique character and culture of each member. No digital procession, no digital reverb, no digital effect were used at any time during the recording session. Winter & Winter combines high musicality with fine analog recording technology. The Volkskrant gave two 5 star reviews about the trio. One for the cd Down Deep, one for the release concert at the Bimhuis, Amsterdam. This extraordinary album is the most thorough integration of jazz, African andclassical elements I have heard. Played with an unforced expressive honesty. The long overdue debut from an impressive trio that has fashioned its own language, one that may not be immediately understood, but still, one that is absolutely and unequivocally felt. Bringing together inventive combinations of unusual instruments, and blending different music influences into a singular sound, the trio has created a magical album of sublime beauty. Ernst Reijseger (born in Naarden, NL, 1954) started playing cello at the age of eight. He studied classical music with Jan Olivier, Anner Bijlsma and René van Ast. In the mid 70s he left the classical music scene and followed his interest for improvised music and jazz. His tutor Anner Bijlsma encouraged him to follow his own path. In the following years Reijseger played and recorded with Derek Bailey, Alan “Gunga” Purves, Franky Douglas, Trilok Gurtu and Yo Yo Ma (to mention a few). He also was a member of the Theo Loevendie Consort, the Guus Janssen Septet, the Arcado String Trio, Trio Clusone with Michael Moore and Han Bennink, Misha Mengelberg’s Instant Composers Pool, the Gerry Hemingway Quintet and the Trio with trumpetist Eric Vloeimans and guitarist Anton Goudsmit. In 1985 he received the Boy Edgar Prize and in 1995 the Bird Award at the Northsea Jazz Festival. Throughout the years Ernst Reijseger has composed and developed outstanding solo performances. Both of his solo albums »Colla Parte« (1997) and »Tell Me Everything« (2008) were highly acclaimed by the international press. All Music Guide (Four Stars): “… the music is punctuated by rapid flourishes that make use of various capabilities of the cello. There are passages involving hand percussion on the body of the cello, for example, and modern jazz drumming and the freer varieties of jazz in general seem to be important components of the music. […] Tonally the music makes use of extended harmonies; it generally has clear tonal centers. The jazz influence is by no means thoroughgoing: there are echoes of Bach’s music for unaccompanied cello, of Romantic virtuoso music, and of minimalism. Reijseger never does the same thing twice, and in fact the pieces resemble each other very little, which is quite an accomplishment for a disc of solo cello music. The sound, recorded in a medieval Tuscan commenda, or commandry house, is magical.” In 2010 Ernst Reijseger received the renowned Edison Award, one of the most prestigious music awards of The Netherlands. Ernst Reijseger collaborates with the Italian pianist Franco d’Andrea, the French clarinettist and saxophonist Louis Sclavis, the Norwegian accordion player Stian Carstensen, the Russian pianist Simon Nabatov, the Amsterdam String Trio, the Senegalese singer Mola Sylla and the African percussionist Serigne Gueye, the Tenores e Concordu de Orosei from Sardinia, the Scottish multi-instrumentalist Alan “Gunga” Purves and the group Groove Lélé from the island La Réunion. Ernst Reijseger composes and records soundtracks for various films. 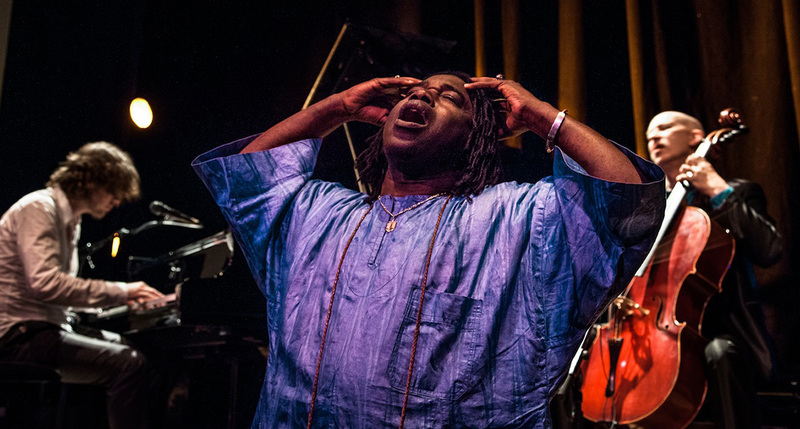 Singer, percussion player and composer Mola Sylla (born in Dakar, Senegal, 1956) was raised in the capital of Senegal in the tradition of the ‘griots’, who play a very important role in the culture of West Africa. It’s this huge and rich heritage from which later he will draw his source of inspiration as a singer and musician. He arrived in Europe in the 1980s with his first band called Senemali. In 1987 he permanently settled in Amsterdam where he still lives. In the Netherlands he met cellist Ernst Reijseger. Since the very beginning Mola Sylla and Ernst Reijseger started a fruitful artistic collaboration. Mola Sylla sings mostly in Wolof, the language of Senegal, that has survived alongside French and which is spoken by 90% ofthe Senegalese people. In his lyrics he reflects the circumstances of colonialism and talks about the history of his people. Mola Sylla plays many traditional African instruments, such as the m’bira, the kongoma and the xalam, and creates his own unique sound world. 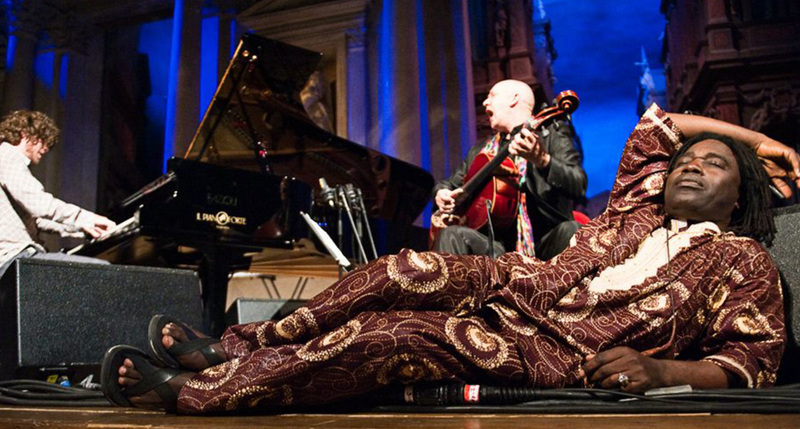 His singing, rhythms and melodies are inspired by the tradition of his African culture. Harmen Fraanje (born in Roosendaal, NL, 1976) started playing the piano when we was six years old. He studied jazz piano and improvised music at the conservatories of Tilburg and Utrecht. Already during his studies he started to play with some of the leading musicians in Holland, like Eric Vloeimans, Anton Goudsmit, Hans van Oosterhout and Hein van de Geijn. Today, Harmen teaches himself at the Conservatory of Amsterdam. 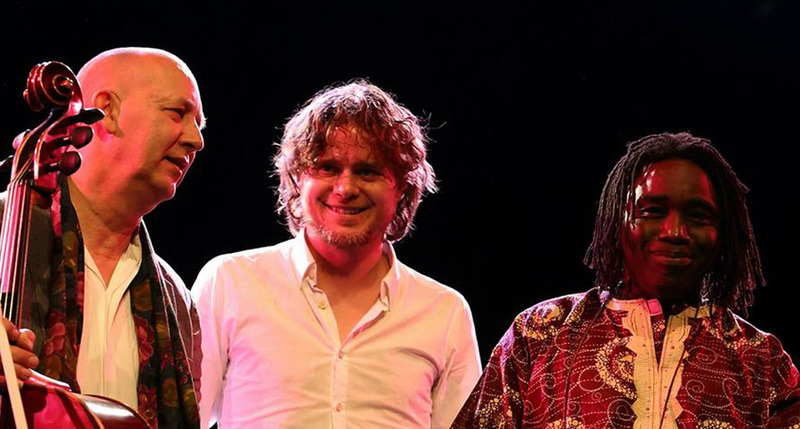 In 2007 Harmen is chosen as young VIP by the Dutch jazzclubs, and he is offered an extensive tour with the band Aneris, consisting of Michael Moore, Brice Soniano and Toma Gouband. In 2008 Harmen is offered a “Carte Blanche” by the Mundial Festival Tilburg and he invites Ernst Reijseger and Mola Sylla. That’s the beginning of the trio Reijseger, Fraanje, Sylla.